Rockbox Theater lights up your holiday season November 18-24 with a new Christmas show for kids who are kids and grown-ups who want to be. With up to six weekly showtimes, our cast of fourteen entertainers and musicians (our largest cast ever) guarantees a rollicking good time for the family with a high energy mix of comedy and variety music featuring pop, rock n roll, and country hits of the Christmas season, plus a visit from the man with the bag, ol’ St. Nick himself. 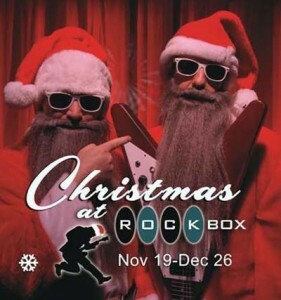 Rated three consecutive years as TripAdvisor’s #1 Attraction in Texas, Rockbox Theater invites you to experience both the magical fun and the sacred meaning of Christmas. As always, our show closes with a thank-you to our veterans and active service members. Group, Youth and Senior discounts available. Handicap accessible. Reserved seating only.